DISCUSSION: Leon Trotsky, martyr or delusional lapdog? Leon Trotsky, a Russian revolutionary and political theorist who studied and believed in the ideologies of Marxism and communism itself, was the prominent leader and founder of the Red Army, and member of the Bolsheviks. Many will know Trotsky as the partner of Vladimir Lenin, but he was also very independent in many of his ideas and practices during his political career. 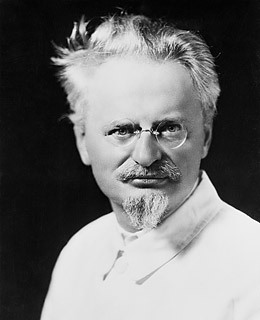 Trotsky was at the fore-front of the opposition against the corrupt politics of the fascist leader, Joseph Stalin, which led to him being usurped from power and exiled from the U.S.S.R. While living in Mexico, he was assassinated by a Soviet agent under command of Stalin. Nevertheless, Trotskyist ideas manifest in the minds of many Left supporters, including perhaps, many of our comrades here. Do you support Trotsky and his political ideology? Why, or why not? Feel free to raise other concerns or questions regarding Trotsky or Trotskyism. + Fidel Castro, hero of the people or another autocrat? Re: DISCUSSION: Leon Trotsky, martyr or delusional lapdog? Here is a lecture about Troskism or Leninism - which would support the delusional lapdog side of things. The video is private, Chev. We can't view it.